Easter morning is the most egg-citing time for the kids to enjoy all the toys and treats left by the Easter Bunny! And what better way to celebrate this special holiday than with Easter games for the whole family to enjoy? 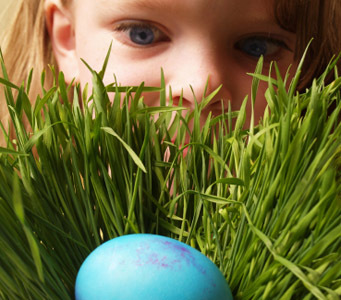 Easter Egg Hunt - An absolute must on your Easter game itinerary has to be the "Easter Egg Hunt," when the children can search for colorful eggs hidden in the yard and collect them in their baskets. This game usually entails the parents hiding either plastic eggs filled with sweet treats and toys, or painted boiled eggs prepared the day before in the yard for the children to hunt for later. Then after the hunt, the kids can count how many eggs they found and enjoy the fun prizes and treats inside each egg. Of course there are other fun versions of the traditional egg hunt that can be just as entertaining, and maybe even a little more challenging. Instead of filling colorful plastic eggs (found at your local party mart or grocery store) with candy or toys, try filling them with strips of paper that have clues written on them that will lead the children to an even larger egg with a special prize, such as a toy car or hair barrette. You can even try assigning a certain colored egg for each child to search for and then give them a special reward for that particular color. For example, if the child is a girl she can be assigned the color yellow and then win a doll when she finds a yellow egg. Easter Egg-on-a-Spoon Race - Keep your friends and family on their toes by adding this tricky game to your Easter celebration. The egg-on-a-spoon race is simple to organize, but challenging to win. All you need for each contestant is a spoon, a decorated Easter egg and of course a long ribbon or rope to use for the finish line. The object of the game is to walk (or run if you dare) past the finish line first without breaking the delicate egg sitting in the spoon which you must carry in your hand. If you prefer not to destroy the beautiful eggs you spent so much time painting the night before, you can substitute them with plastic ones. The first to cross the finish line without letting their egg drop out of the spoon is the winner, and can be rewarded with a prize basket, plush bunny rabbit or delicious chocolate egg! Easter Egg Roll - Try incorporating this annual White House Easter tradition to your holiday celebration. Though not a necessity, the Easter Egg Roll is ideal when played on a grassy lawn with a slight tilt so the egg rollers can easily roll their colorful Easter eggs with wooden spoons along a path in their race to the finish line. All the materials you need to set up an Easter Egg Roll in your yard is long wooden spoons, decorated hard-boiled eggs and string or ribbon to use for lanes and a finish line. The contestant who can roll their egg using a wooden spoon along the path and reach the finish line first is the winner!